*Items are being added daily so check back often. Sign up here to receive updates. Click here to browse our newest listings. Vintage LeFtOVeRs sells high quality collectibles at affordable prices. We specialize in advertising promotions and ephemera made by Coca Cola, McDonald’s, Howard Johnson’s, and “mom-and-pop” drive-ins. These and other brands evolved along America’s main streets, highways, and roads. Roadside culture was the source for many of the symbols reflecting the sensibilities and values of mid-20th century America. Probably everyone has a memorable story of a drive once taken down a winding, open road like Route 66! As a result, these stories live on through the 2,500+ rare relics for sale here, at Vintage LeFtOVeRs. While these were once ordinary advertising promotions, now they are collectible “leftover” artifacts—and art—of an American era long gone. As marketing tools, they served their purpose. Today, therefore they endure as cultural icons sporting familiar logos and characters. It is noteworthy how they have retained their power to touch the hearts of people of all ages, the world over. Collectors of ephemera, characters, art, history, memorabilia, and antiques crave our treasures! 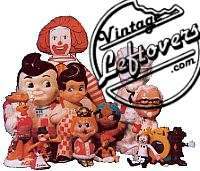 Browse the Vintage LeFtOVeRs store for a wide variety of items of historical and nostalgic value. Dated from the 1930’s through 1980’s. Discover rare dolls, coin banks, advertisements, clothing, toys, barware, games, postcards, kitchenware, etc. Our one-of-a-kind collectibles are original and hard to find. Vintage items are guaranteed authentic. Non-vintage items are clearly noted. Hence, we guarantee 100% satisfaction with every purchase. So if you’re hungry to build a collection or you crave a unique gift, make Vintage LeFtOVeRs your #1 source for the “memories” we have enjoyed chasing!